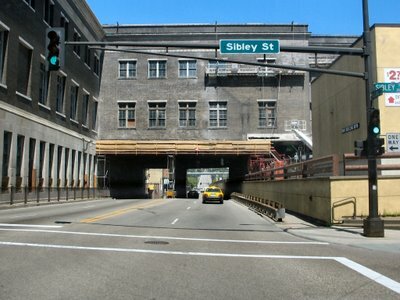 As you leave downtown St Paul via Kellogg Avenue, you pass under some office space that is currently under construction. The passage way is barely enough room for two vehicles to pass side by side, but it's used every day. 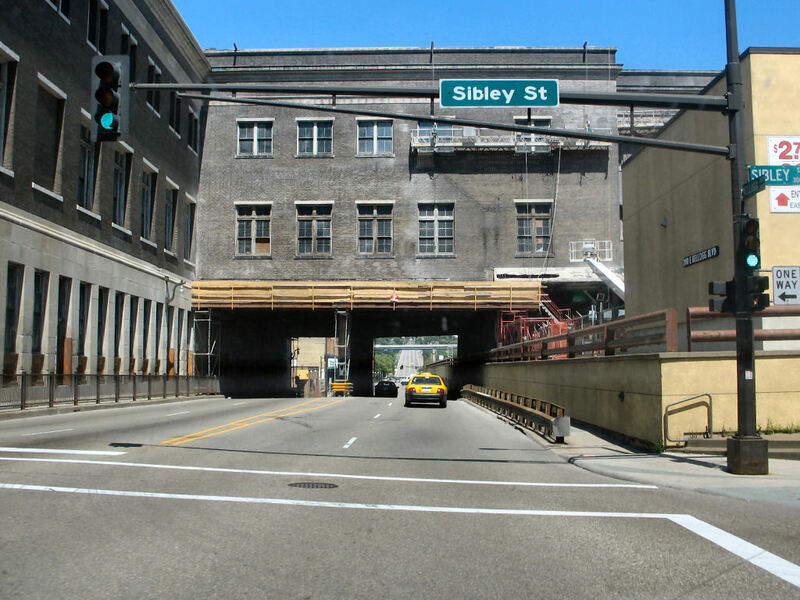 After you pass through the tunnel, you'll be on the 3rd Street bridge and headed into the "East Side" neighborhood. 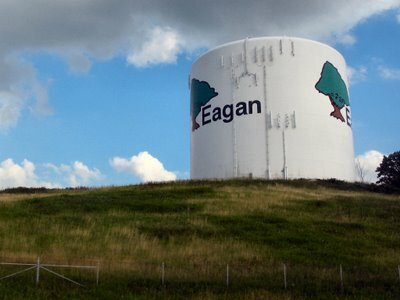 If this was a winter photo, the title would make much more sense because our winter months can be brutal. 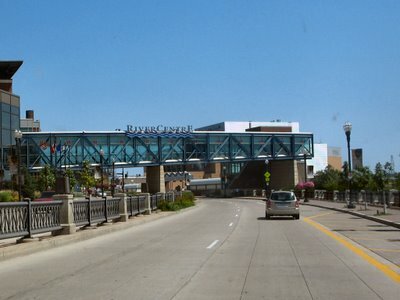 This skyway is from the parking ramp into the River Center which holds a lot of events of various types. The skyway system connects almost every part of downtown St Paul to each other so you rarely have to step outside during the cold months to get anywhere downtown. 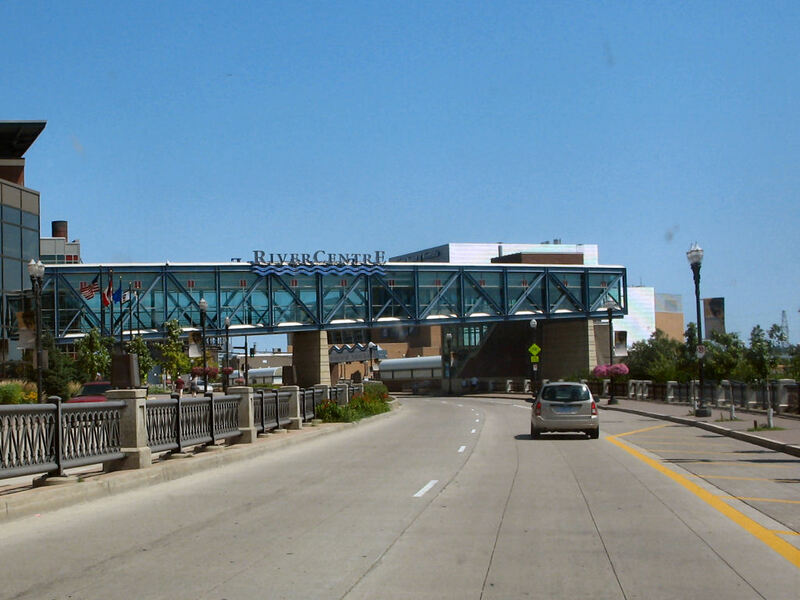 The RiverCenter is connected to the Xcel Energy Center from the previous daily photo. 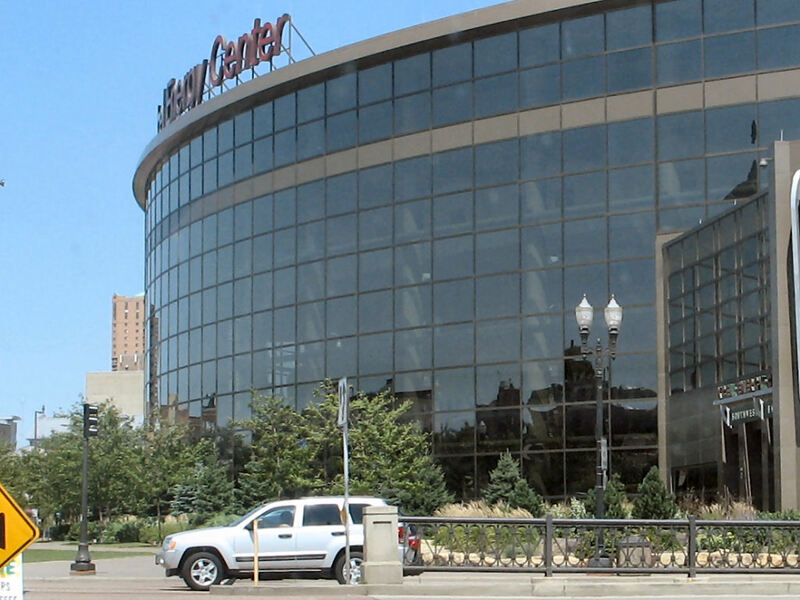 The front of the Xcel Energy Center boasts this huge arched wall of glass. 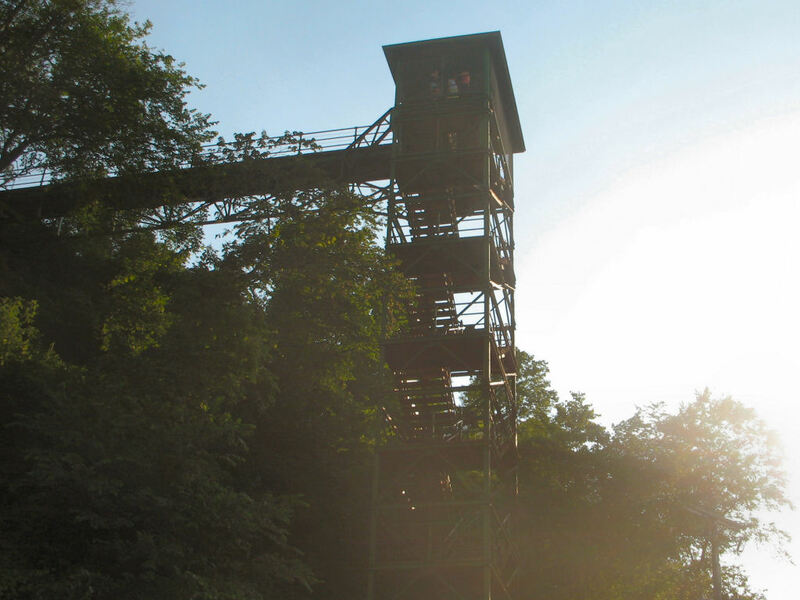 It's quite the grand entrance once inside and makes for a good place to watch the snow fall in the winter months. The Xcel Energy Center is the home of the Minnesota Wild NHL Hockey team. 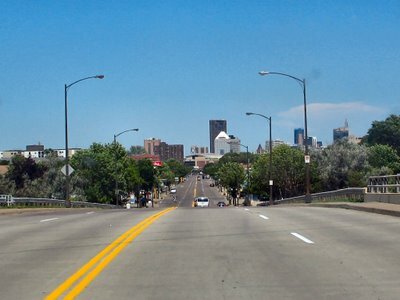 I'm headed into downtown St Paul on 7th Street just as I'm crossing a small bridge that goes over a couple of rail road tracks. 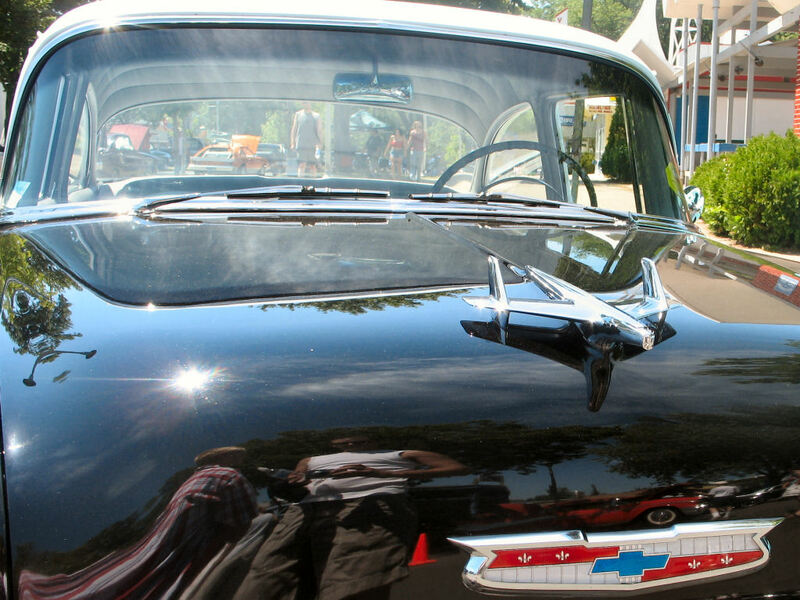 I was mainly taking a photo of the hood ornament as I wish something like this was still in use in today's vehicles. It adds character to any vehicle. 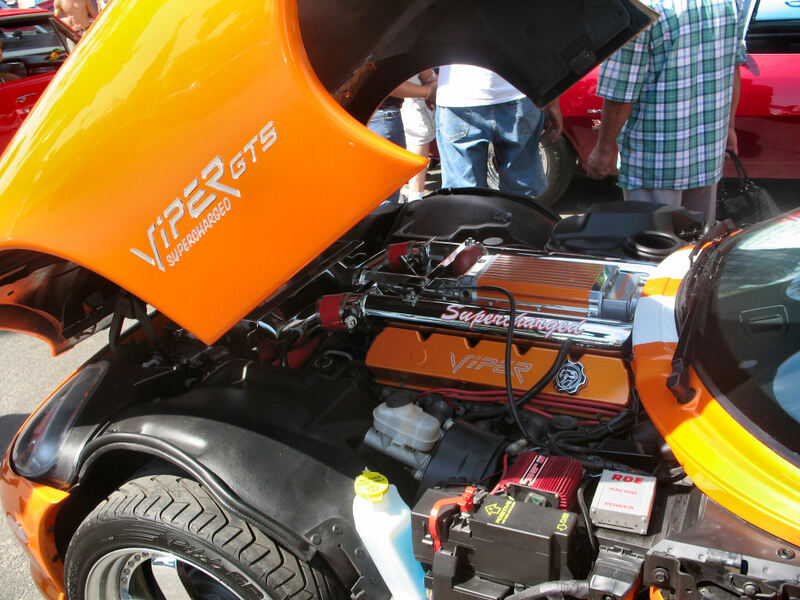 When I looked at the photos from the Car Craft Summer Nationals Car Show this past weekend. I found my reflection on the hood and laughed. 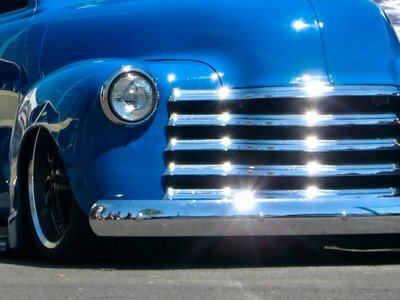 In addition to my reflection, there is so much more to see on the hood and through the window I included it all for your viewing pleasure. 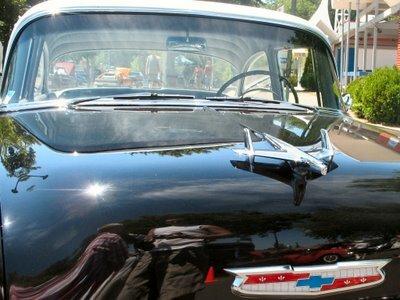 I went to the Car Craft Summer Nationals Car Show over the weekend which was held at the Minnesota State Fairgrounds in St Paul. 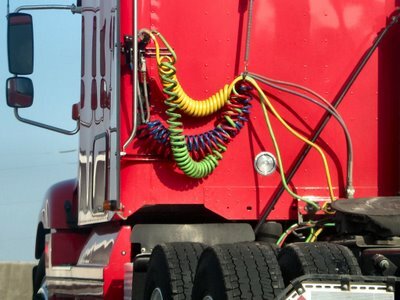 I took a few great shots of some wonderful looking vehicles. The main requirement to be in the show was it had to be a muscle car. 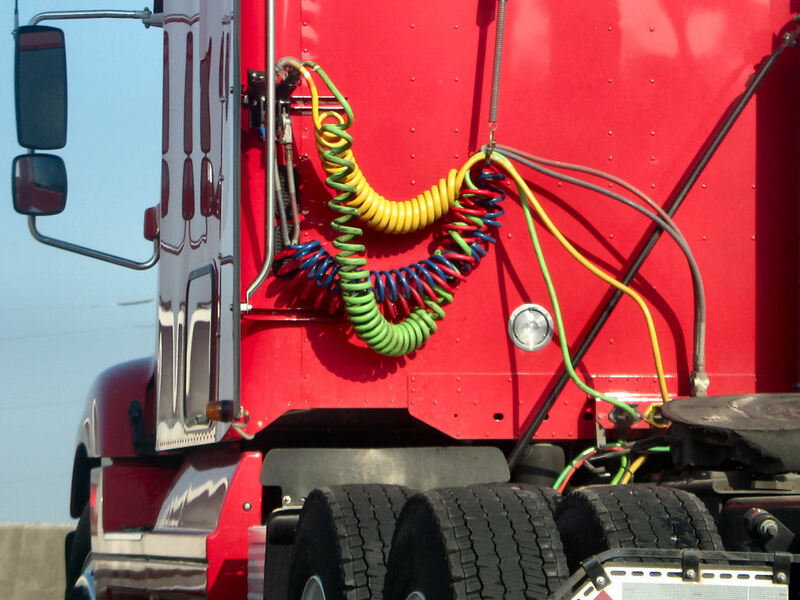 This truck was spectacular looking. I believe there was some hydraulics involved because the truck was sitting about a half inch off of the ground and there is no way you could drive in St Paul with that low of clearance. This is one of my favorite photos I've taken so far, enjoy. 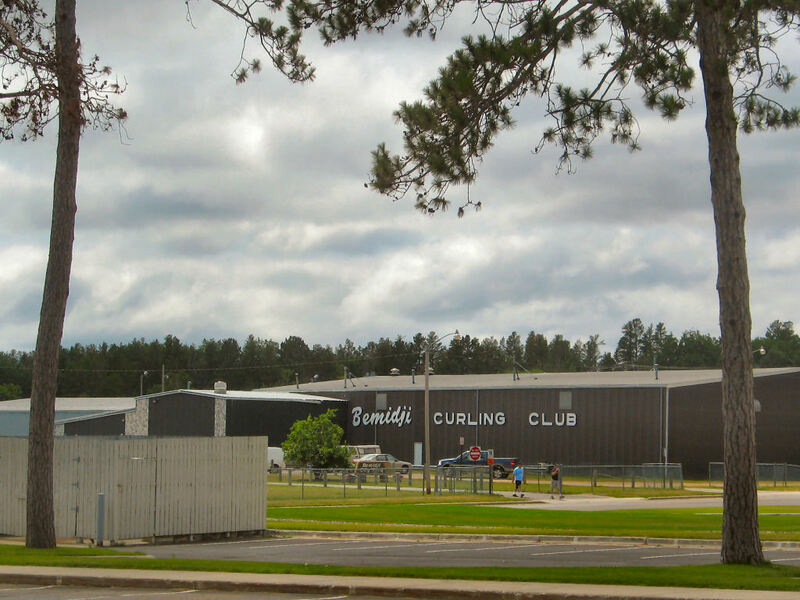 During my trip to Bemidji a short time ago, I took a few photos of the town of course. This one of the Junction Barber Shop brings back a memory of my wife's Grandfather. That was the only place he ever had his hair cut at. 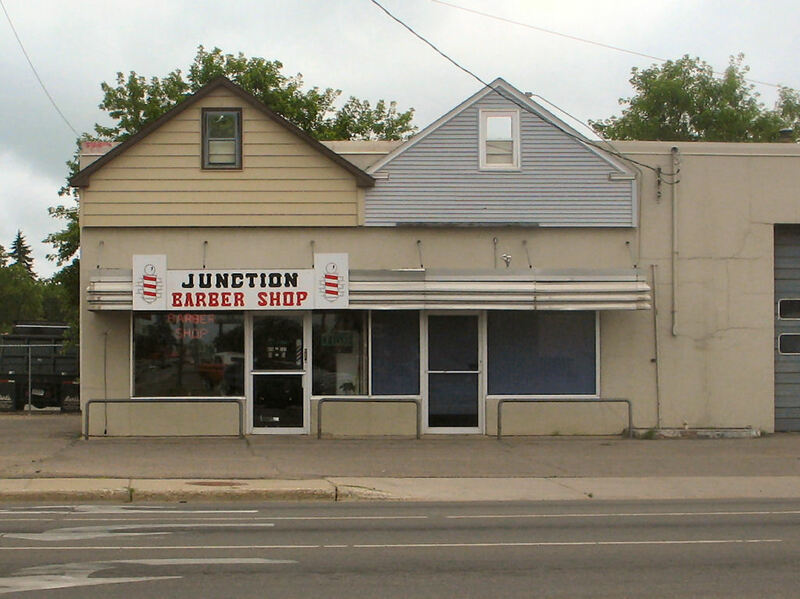 I would guess about 10 years ago when we were there for a wedding, I wanted to get my hair cut and was pointed in the direction of the Junction Barber Shop. I sat down in the chair and the barber starts cutting my hair, without asking me how I wanted it cut. Friendly as can be and knew everyone in town, including my wife's grandpa. He finished his work on my hair and the cut was exactly how I would have told him to cut it. I've always liked this home on George Street in the West Side neighborhood of St Paul. 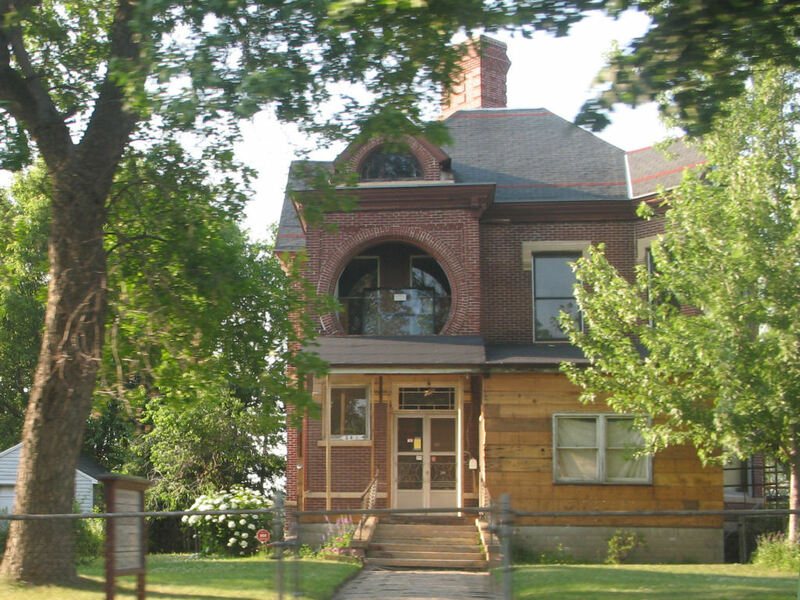 The rounded arch window, the brick work always stood out. Most of all, the chimney and how it is turned in a way I've yet to see on a building makes this home unique. 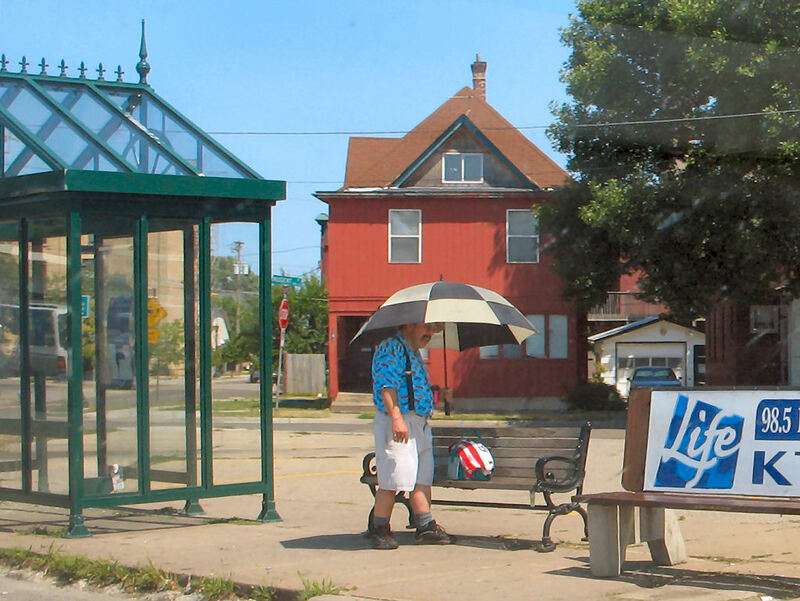 Each summer in the Twin Cities we hold a contest for the most creative idea with the use of duct tape. There have been some fabulous entries in years past, including a playground slide, 1:25 scale of the Eiffel Tower, 426 Hemi Block & Engine and a working waterfall. The 2006 competition was just as spectacular from previous years including this entry of a working rear hatch door on this Plymouth Voyager minivan. 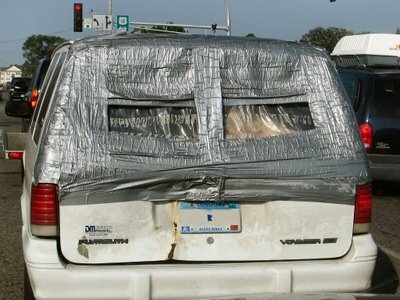 While this entry didn't win the 2006 Duct Tape Contest, it did place 4th in the overall competition and 1st place in the 'real life uses' category. This may sound quite odd, but we also have a yearly competition in Minneapolis during the Aquatennial Celebration called the 'Milk Carton Boat Race'. Yep, we have a race and our boats are made of milk cartons. 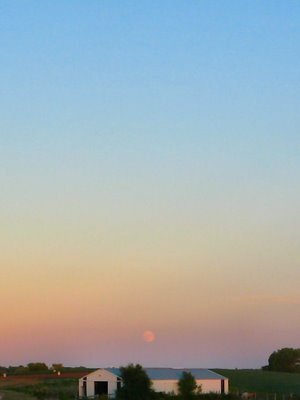 Was driving home from a trip up north to Bemidji, I turn off of Military Road and on to Jamaica Avenue which cuts across a corn field and into Cottage Grove when we see the moon on the horizon. The photo doesn't do it justice as the size of the moon was larger than normal in appearance. The entire sky was clear, the sun was setting on the opposite side of this photo, the entire sky had a natural rainbow effect to it. 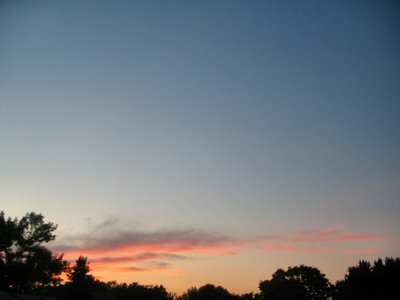 You can see the sky colors in this photo, but imagine the entire sky filled with the colors in the photo as far the left and right as possible and you'll get a better picture of what I was seeing. I went to the Men's basketball regional finals game in Minneapolis during the Final Four tournament this past March. We had great seats and the match up was between Villanova Wildcats and the eventual tournament winner Florida Gators. This tournament is one of my favorites that is held throughout the year. In addition to this daily photo blog, I run a March Madness Final Four Office Pool as a hobby. It's open to any one who is interested in this sort of thing, but there is no prizes either, just bragging rights. 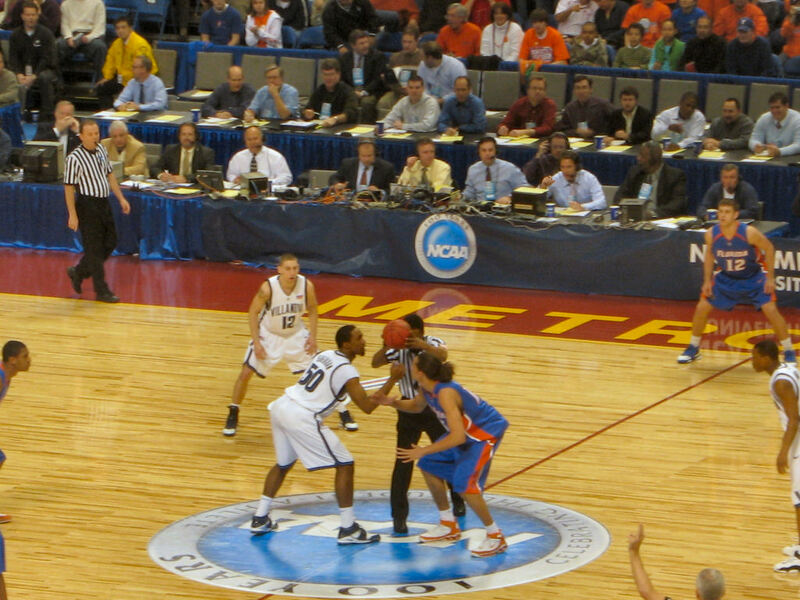 This photo is from the opening tip off of the game. 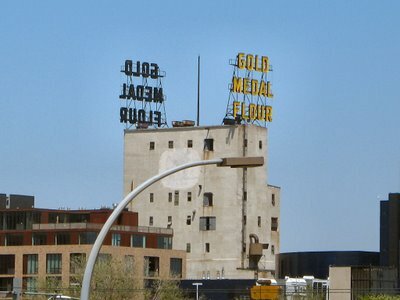 Sitting at the stop light in downtown St Paul on the corner of Wabasha and Kellogg Boulevard, looking to the left is the old commerce building. The building itself sits on 4th Street and Wabasha Street, so I'm about a block away. The ferris wheel ride in the Park at the Mall Of America. 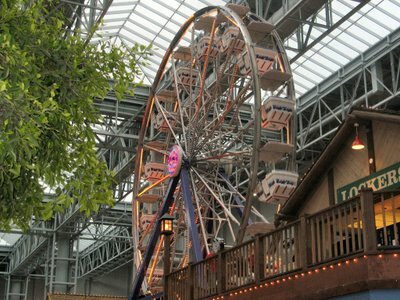 The park inside the mall is quite large in size. Three roller coasters, the ferris wheel in the photo and various other rides for all ages. Some of my favorite types of photos are of brickwork with lots of patch work that has been done over the years. This building is a great example of many different repairs, additions, deletions, remodels, and a bit of worn out painted words. I've looked at this picture for about a month and I've tried to figure out what Hotel this used to be from what remains, but the best I've come up with so far is TOBRSY HOTEL. Perhaps you can see something I cannot. There is a bit of controversy over which building is the tallest in Minnesota. 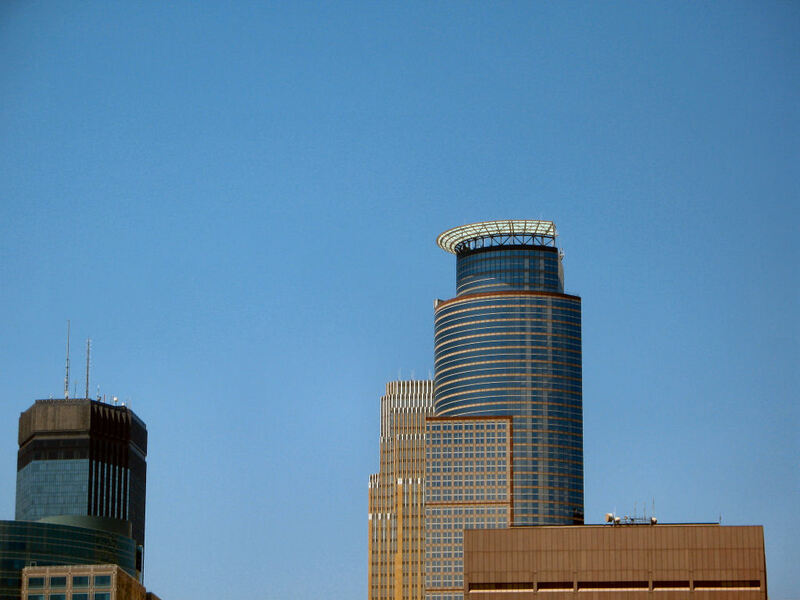 The two contenders are the IDS Center and the Wells Fargo Center. 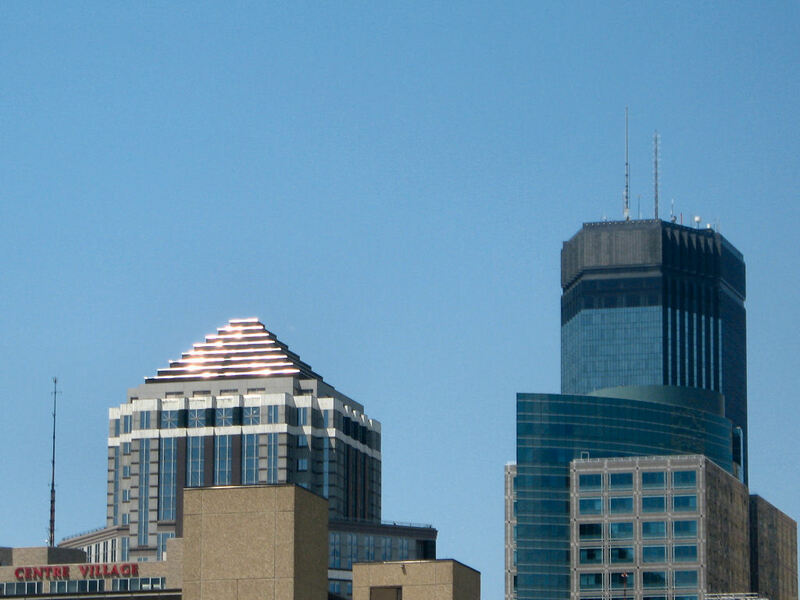 Up until 1992 when the Wells Fargo Center opened in downtown Minneapolis, the IDS Center was the tallest building in Minnesota. 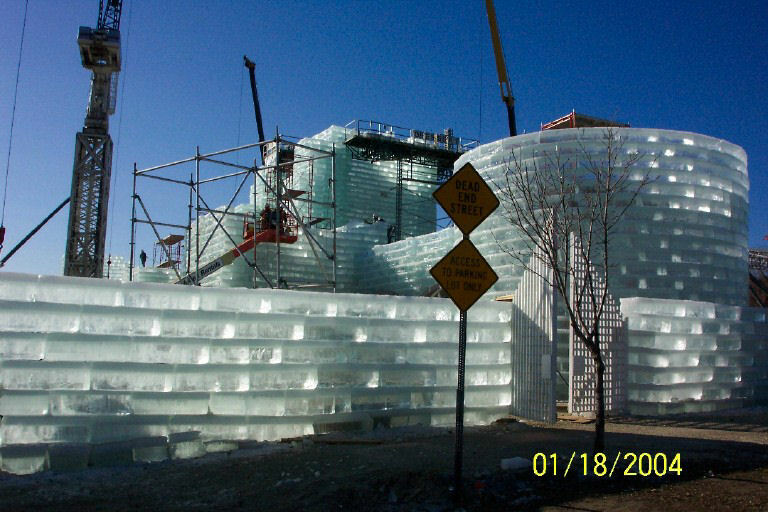 In 2005 however, it was decided that a 16 foot wash room garage on the top of the building was added to the buildings height, topping it once again as the tallest building by a foot or two. My guess is, this controversy will change status a few years from now when the Wells Fargo Center adds an 18 foot wash room garage to the top of their building. 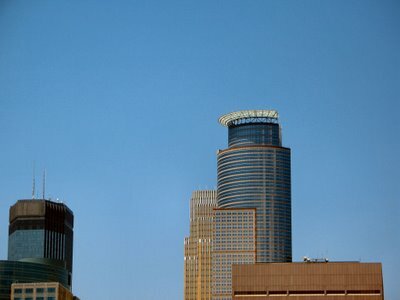 The lower left corner building is the IDS Center, the building with a partial halo is the Wells Fargo Center. 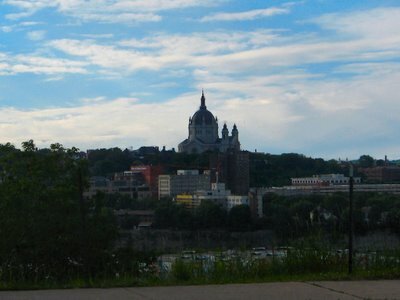 Actually, down the bluff, across the Mississippi River, past many buildings and a highway, then up the hill we finally come to the Cathedral in St. Paul. I'm not sure how far away it is from where I'm taking the photo, but it can easily be over looked as there is so much to see. I'll save those views for another time. 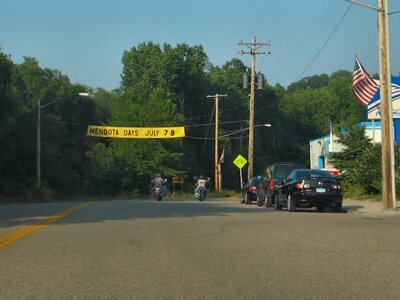 I was following two bikers on Highway 13 headed north into Mendota when I saw their banner strung between two telephone poles about their up coming festival. July 7-8 is Mendota Days, be there one and all. I've never attended the festival, but I really wanted to get the two bikers in a photo and this was the best of the bunch. The third photo of my Ice Palace series set from the 2004 Ice Palace that was built for the St Paul Winter Carnival. 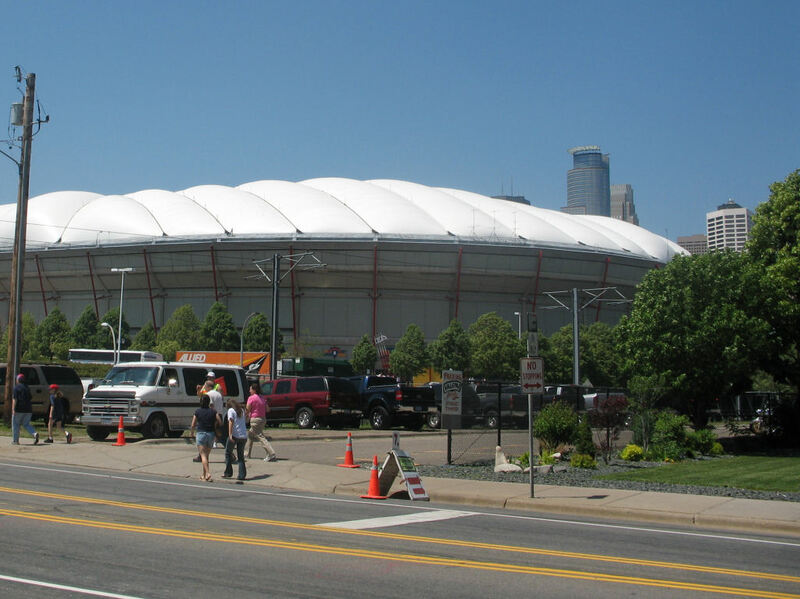 The palace was built across from the Xcel Energy Center where the Minnesota Wild hockey team plays. Had to post a tribute thread to the Minnesota Twins baseball team, eleven wins in a row. Tonight in the 8th inning, they had one hit, two wild pitches and one throwing error to score three runs and take the lead for their eleventh win in a row. 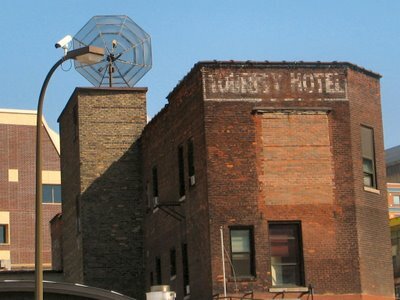 This photo was taken on my journey to see them play while walking along 3rd street I believe. I have a few other fans plus a bargain at $7 dollars for parking during the game. My daughter said to me, "daddy the clouds are pink", which is her favorite color. I turned around as I had my back to what she was looking at and sure enough, there was a decent looking sunset. That's all there was in the sky for clouds, the rest was clear as could be. We were not exactly in an area to see the sun set as there were too many trees in the way, but this shot turned out quite nice for what was available at my location. 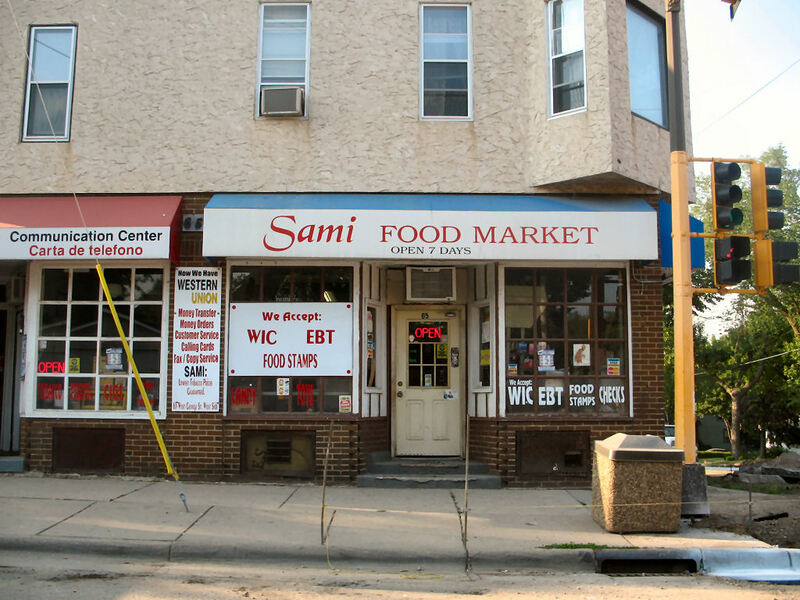 Another small market place in my old neighborhood. 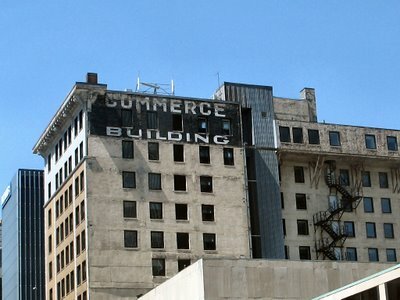 I don't recall what the original name of the store was, but I recall buying some baseball cards and some penny candy here at one time when I was very young. 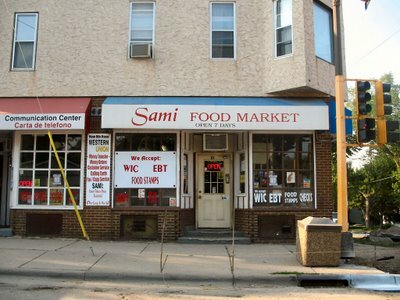 The new name is Sami Food Market, I'm not sure what type of food they mainly sell as I've never been in the new owners shop. 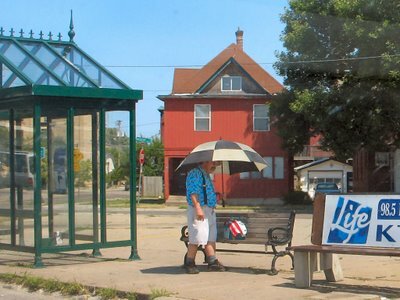 It's on the corner of George Street and Striker Avenue across from the Dairy Queen in the West Side of St Paul. They certainly offer a lot of services, some I'm not sure what they accept, WIC and EBT....some food assistance or some sort I would guess? 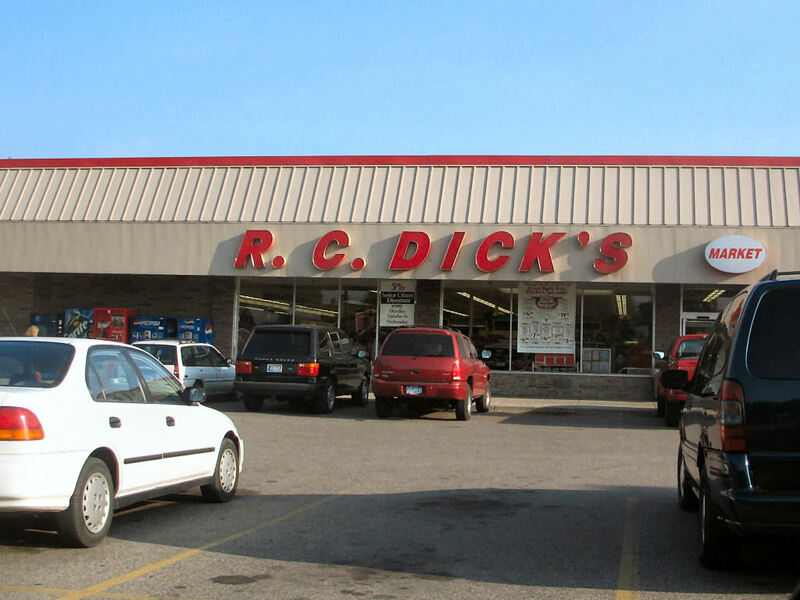 This is my childhood supermarket growing up. 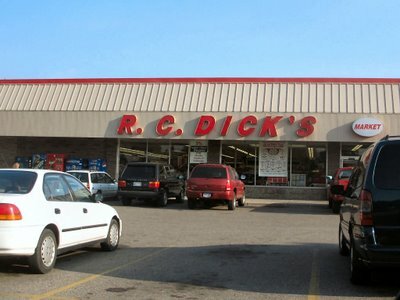 It was once called Applebaums, has gone out of business and is now called RC Dicks. It is quite small in size, but enough to fill your fridge and oh the memories it brings back. It is located in West St Paul just off of Smith Avenue and Dodd Road.